"I got thrown from my horse, about a mile back." As Charles checks over the bike, he is spotted by its owner — Phil — who approaches warily, unsure what to make of this trespasser and his story. Description: The farmhouse where Charles finds — and then steals — the bicycle is Riversdale Farm in Monsal Dale. 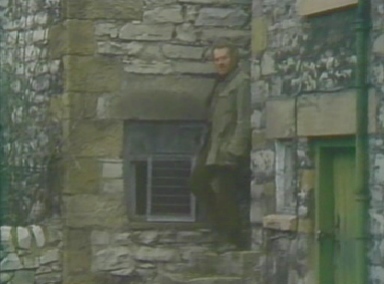 The stone stairway down which Phil descends is (from the camera's point of view) on the left side of the main farmhouse. Where is it? : Riversdale Farm is located on the roadway leading steeply downhill from Monsal Head into the valley. It is situated between Netherdale Farm (where the sequence of Charles' discovery by the young girl was filmed) and Upperdale House (the location for Charles first encounter with Jim and Sanders). Where's the best vantage point? : The shot is taken from the now-tarmaced yard in front of the main farmhouse. In 1977, the yard, and trackway along which Charles escapes with the bike, were mud. What about access? : Riversdale Farm is a private residence — fans should not trespass on the grounds of the property, but should seek prior permission before visiting. The owners of Riversdale Farm have been very accommodating to Survivors fans during previous location visits, allowing fans to enter the farm grounds and revisit the precise filming locations. The general area in which the scenes were filmed is visible from the public highway. Anything else? : Riversdale Farm offers self-catering accommodation for families and small groups of visitors, in two adapted cottages adjacent to the main farmhouse. For details see here. 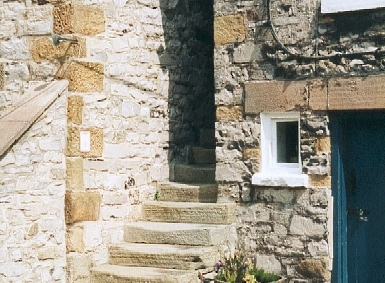 The cottages are situated just behind this stairwell.